The man behind the successful Modesto’s restaurants in Malaysia talks about his recipe for success. 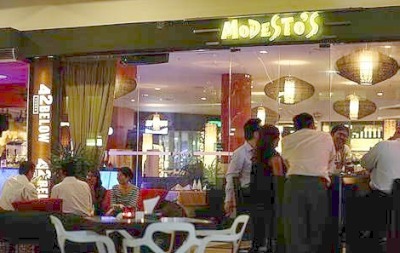 DID you know that Modesto’s was the first Italian restaurant to introduce the thin-crust pizza in Kuala Lumpur? So says Modesto Marini, the 39-year old restaurateur extraordinaire behind the immensely popular local restaurant chain. Marini’s success story started with a chance meeting with Malaysia’s “king of dance clubs”, Bob Wong, in the mid 1990s. Today, their company, the Heritage Group of Restaurants & Clubs, of which Marini is managing director, oversees all eight Modesto’s outlets in the Klang Valley, including the newest in Kuala Lumpur’s Capital Square, and one in Johor Baru. All pretty impressive for a man who decided he wanted to become a chef at 17. After completing his professional culinary training, he spent two years in London working at Cecconi’s – a top Italian restaurant favoured by celebrities – and then another three working in Singapore. Marini decided to venture across the border in 1994 and came to Kuala Lumpur, fell in love with the city and stayed! Marini’s first Modesto’s was housed in an old bungalow in Lorong Perak, Kuala Lumpur, and opened its doors in 1995. It was the first restaurant in the city to incorporate a bar, dance club and entertainment hot spot on its premises and, needless to say, its unique all-in-one concept took the city by storm. Just over a decade later, Marini not only has a string of restaurants in the Klang Valley, but the Heritage Group also runs two clubs and two bars in Kuala Lumpur and Johor Baru. By the first quarter of 2009, Modesto’s will also have spread its wings to Kota Kinabalu and Marini doesn’t discount opening more outlets in foreign shores. So what is the secret of his success? Although his days of slaving away in the kitchen are over, the intrepid entrepreneur remains firmly in control of what goes into the menu and oversees the wine list at all Modesto’s restaurants. He says: “Modesto’s offers a good mix of classic specialities from all over Italy. Most of them are light, summery dishes such as beef carpaccio (paper-thin beef slices with extra virgin olive oil and parmesan) and thin-crust pizzas to suit the weather here. You’ll never tire from eating these every day due to the simple, delicious taste. “Customers are becoming increasingly health-conscious but our Italian dishes remain as popular as ever because we use a lot of tomatoes, extra virgin olive oil and balsamic vinegar which are known for their healthful attributes in our cooking. 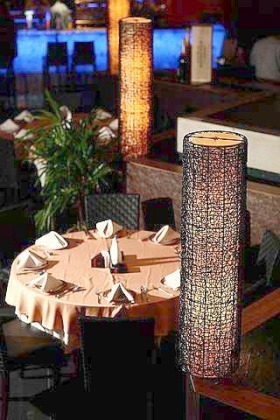 However, as variety always adds spice, Marini makes sure that the menu always includes something new. To offer even more variety, the latest Modesto’s outlet at Capital Square has incorporated a Japanese sushi and sashimi bar. Marini seems perfectly at ease with this somewhat unconventional addition to his Italian eatery. “We just want to offer our customers better variety. If they want something apart from the usual Italian fare, we’ll try our best to oblige. I guess this is what makes Modesto’s unique – each of our outlets has something different that caters to the clientele in that particular locality. Simple Italian cuisine served in a warm ambiance has been Modesto’s winning formula. When asked if he has had any bad experiences with fussy or obnoxious customers, Marini dismisses the question and declares that the customer is always right. Since he spends six days a week on the job, Marini admits that he hardly celebrates Christmas, New Year or any of the special occasions since these are the busiest periods for him and his team. “After all these years, I’m used to it. I’m thankful Modesto’s has lasted so long. This alone is a celebration in itself,” he says.